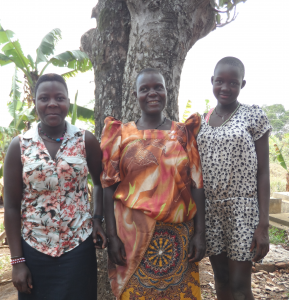 Jane (centre) stands with daughters Hamlimah (left) and Josephine (right) outside their family home. 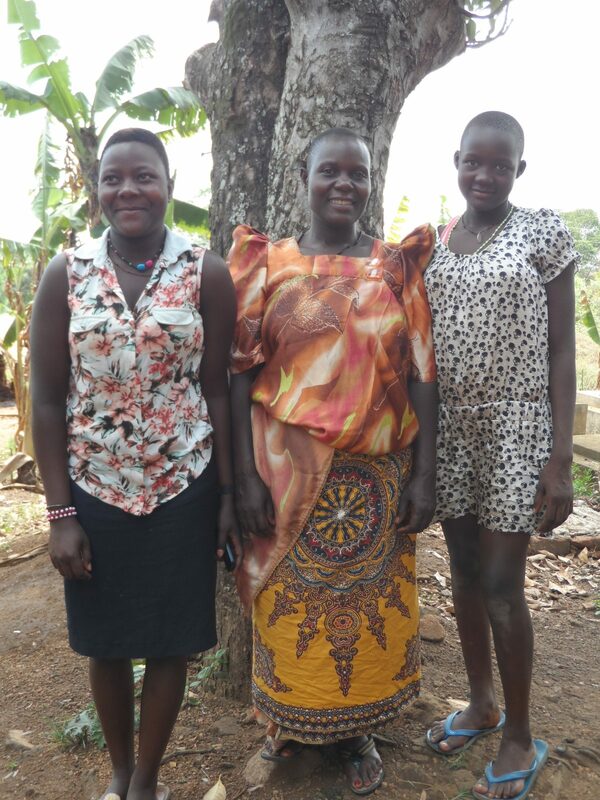 “There are things that happen to me and give me courage that one day, my family and my children will be happy,” Jane told us, leaning against the wall of her home, in the Wakiso District of Uganda. When we walked through Jane’s yard, the soil was wet from a heavy rain the previous night. We could hear the noise from the school next door – a private school, which Jane could not afford to send her children to. It is in this home that she has raised her five children – including Josephine, a 12-year-old girl who loves to sing and go to school. But it wasn’t always that way. Jane tried to enroll Josephine in a nearby nursery school when she was younger but she was chased back home for not paying the fees. She couldn’t afford to send Josephine and keep her two eldest daughters in school too, and so she was forced to pull her out. Jane worked hard doing laundry for other families and helping out at a small, local catering business to earn an income. But it was never enough. Then a message of good news came from Canadian Feed The Children’s local partner HUYSLINCI, which Jane now warmly refers to as “our HUYSLINCI.” Josephine could now start primary school! Josephine, aged 12, speaks with HUYSLINCI staff at her school. With all of her children in school, HUYLINCI staff worked with Jane to learn new skills to better support her family. Jane was provided with a piglet from another woman in her community through a pay-it-forward program, where community members pass on livestock to the next family in-need. 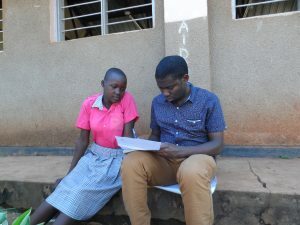 She also received training on how to feed the pig, detect signs of sickness, provide the proper sanitation, how to spot a pig “in heat”, and the importance of paying forward the gift of a pig to the next family once she successfully bred hers. This year, Jane is going to give one pig each to four other women in her community this year, so that they can start a piggery project like hers. The other pigs are hers to keep, breed, and use as assets for her family. She plans on using the proceeds to fund Josephine’s university education and to keep the rest of her children in school. 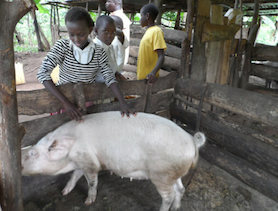 “Passing on pigs builds solidarity among community members – this is something that used to be in our society, when we shared our harvest with others, and so much more,” she explained. Jane looks lovingly at Josephine while talking about her daughter’s future. Jane shares the same dream as many parents around the world – that her children will attend school, get a good job to take care of their family, and live a healthy, happy life. And, thanks to the piggery project, she is helping other parents achieve that dream too. Jane also has big plans for herself. 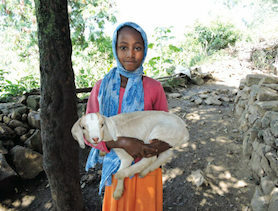 Once she earns enough profit from her pigs, she plans to start a poultry business and a goat project too. When we support parents like Jane, we help strengthen communities, provide women with new opportunities, and give children around the world a brighter future. Pigs are an easy-to-raise, quick-to-reproduce source of nutrition and income that can sustain families for years to come. 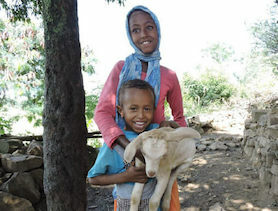 Fast to reproduce, hardy, and easy to care for, the gift of a goat gives a rural family a welcome form of nutrition as well as sustainable income. Animal vaccinations and veterinary support provides rural families with the essentials for keeping animals healthy and productive.